If you’ve always dreamed of vacationing in paradise, you should take a trip to the North Georgia Mountains. Mountain Escapes is the premiere North Georgia Cabin Rentals for the perfect mountain vacation. 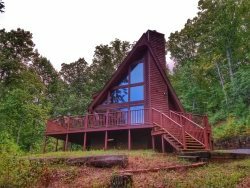 For over 15 years Mountain Escapes has made dreams come true offering North Georgia Cabin Rentals for every occasion. With so many cabins to choose from, we know there’s a cabin waiting to make you and your family feel right at home. Whether you want a mountain view or a cabin situated on a river, just give us a call and will make sure you get the cabin you want. Mountain Escapes offers North Georgia Cabin Rentals in Blue Ridge and other areas such as Polk County. We offer a wide variety of cabins with fireplaces to warm your bones and drink hot chocolate by. After a fun day taking in the sights and breathing that fresh mountain air, don’t forget to relax in a sauna or roast marshmallows outside in the fire pit. We want your mountain experience to be unforgettable, and it all begins with that perfect cozy cabin nestled in the woods or on the side of a mountain. The weather is warming up-now is the time to plan your escape to peace and tranquility. Plan your week-end get-a-way or your big summer vacation, but don’t plan staying at any North Georgia Cabin Rentals. If you want a piece of heaven on earth, the only cabins to experience are Mountain Escapes. Shhhh- can you hear the mountains calling your name?